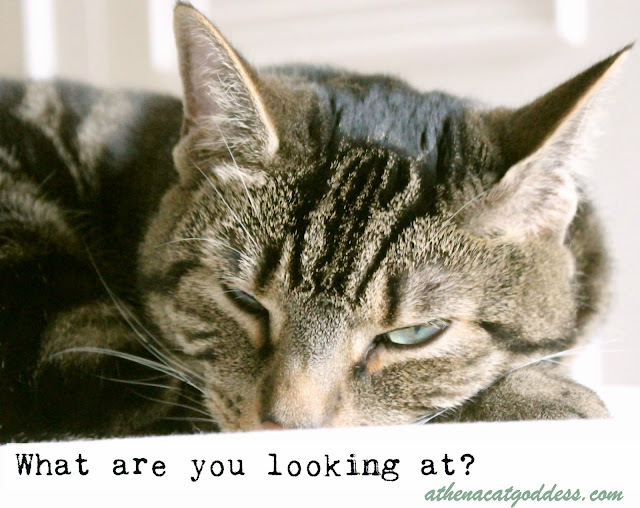 Athena Cat Goddess Wise Kitty: Wordless Wednesday: What Are Your Looking At? Wordless Wednesday: What Are Your Looking At? We hope all our friends in Texas are OK. We have seen the devastation caused by Hurricane Harvey on the news here in England and we cannot stop worrying about the animals and their humans affected by this disaster. That is some stink eye, Athena! Uh oh! Did the photographer disturb your cat nap? Athena, hoomins just love to interrupt kitty naps with the camera! Quite the sly eye! Happy Wordless Wednesday! That's quite a look your throwing, Athena. We send purrs for all the people & animals around Texas & nearby states. I love your cattitude, Athena! That is quite the expression. I hope you are able to get a peaceful nap. Our prayers are with those affected by Hurricane Harvey too. They are going through a very difficult time and it will take years to completely recover. Well....you certainly have the "look" down.